A well-known system which relies on a nylon speed lever in the rear and a stainless steel front bale to hold the boot. Quick to put on, these bindings are perfect for plastic mountaineering boots that have a rigid sole and substantial heel and toe welts. The stainless steel safety strap, which was invented by Grivel, is permanently mounted on the front bale and prevents total loss of the crampon should it be forced off the boot. In grams and ounces, the weight of both crampons together, as stated by the manufacturer/brand. If there are differences in weight (due to multiple sizes or optional accessories) we'll note those here. As for the front bail I’ve used them with three different types of ice and alpine boots, and had no problem with fit. Always, the bail slides right in. As a rock climber, I appreciated the asymetrical shape and position of the front point over (roughly) the big toe. This positioning gives power to your front toe and feels natural. Because the front point only has a small accompanying point—a horizontal and much shorter mini-point—the main point is able to dig deep into seams and picked out placements. Forgot your crampon bag? No problem. Fold the G20 Plus in half. Overall the precision front point allows the G20 Plus’s to feel like an extension of the boot and your thoughts. Most of the time it takes only one fluid kick and each foot becomes a stable platform that instills confidence even when the ice is shattery. While climbing, these crampons melt away from my consciousness and allow me to focus on everything else, conserving energy, placing appropriate gear, and enjoying myself. I don’t think there is much more you can ask from a piece of gear. 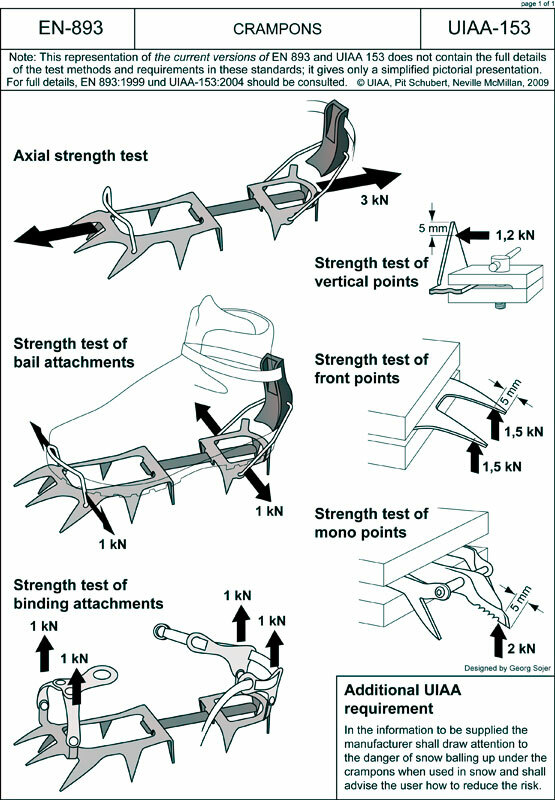 A pictoral representation of the UIAA-153 and EN-893 standards for crampons.